The White House announced that the Pollinator Health Task Force has established a National Strategy to Promote the Health of Honey Bees and Other Pollinators, https://www.whitehouse.gov/sites/default/files/microsites/ostp/Pollinator%20Health%20Strategy%202015.pdf. Involving numerous governmental agencies, the strategy is designed to address the marked declines in populations of honey bees and other pollinators, including North America’s 4000 species of native bees. It also addresses conditions affecting monarch butterflies; their populations have declined by 90 percent. Goals of the strategy include reducing honey bee colony winter losses to historic levels of no more than 15 percent, increasing monarch butterfly populations, and restoring seven million acres of land for pollinators. Some of the features of the strategy include developing affordable pollinator-friendly seed mixes and developing best management practices for minimizing pollinator exposure to pesticides. Public lands managed by the U.S. Forest Service and the Bureau of Land Management may be opened for honey bee forage. Wildflowers may be planted atop contaminated sites following clean-up by the Environmental Protection Agency. We should finally see expansion of pollinator habitat on highway rights-of-way and the development of a native seed reserve. A pollinator corridor for monarch butterflies is planned to extend along I-35 from the Texas border with Mexico northward to Minnesota. One feature of the strategy involves planting native plant species that bloom at different times to ensure continuous bee nutrition. A most important feature of the strategy involves protecting pollinators from exposure to pesticides. The neonicotinoid insecticides will be re-evaluated along with their use as seed treatments. Today’s picture is taken from the poster announcing The White House Garden Lecture Series. I was honored to be invited to speak on bee-friendly gardens at this event in Collierville, Tennessee. The White House bee hive and pollinator garden build awareness of the importance of pollinators in the health of citizens and the environment. 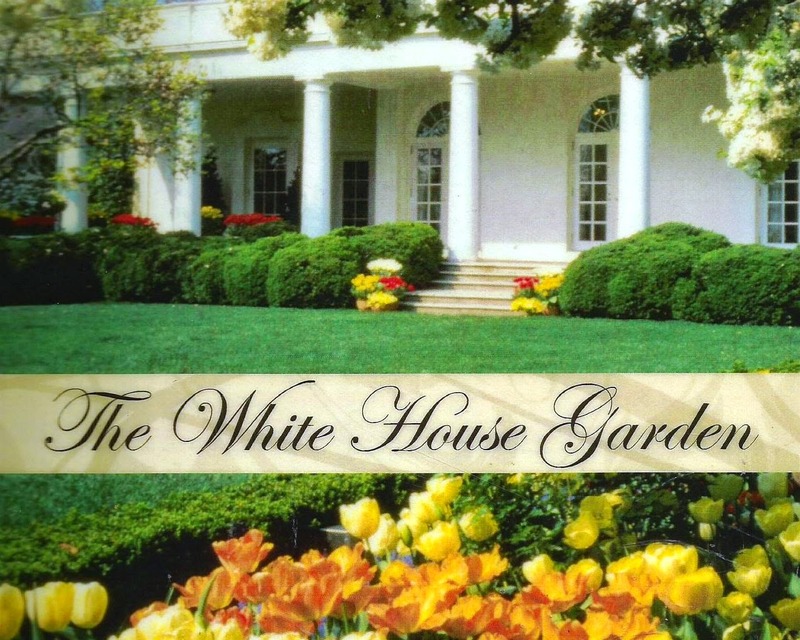 The White House is home to America’s oldest continuously landscaped gardens. This comprehensive bee protection strategy is welcomed by beekeepers. Thanks to all who worked toward its development. Strong and healthy honey bee colonies divide to create new colonies, find new homes, and expand their range in a process that we call swarming. The spring of the year is the time when swarming occurs most often. When a swarm of bees leaves its hive, it is the result of about a month of preparation. The actual timing of the swarming event often follows a period of rainy days. Wet springs, like the Mid-South is experiencing this year, seem to produce more swarms than dryer seasons. One reason for the increase in swarming may be the abundance of available nectar from certain plants during rainy seasons. If the bees have plenty of nectar to forage, they may fill their hive’s brood nest with honey leaving the queen few cells to lay eggs. The resulting brood nest congestion is the principal trigger to swarm. Typically, when a honey bee colony swarms, about half of the bees rapidly exit the hive along with the old queen. The individual bees fly in circles for a few minutes, and then they gather in a resting place on a tree limb or structure. The swarm remains in this location for a few hours or, sometimes, a few days. During this waiting period, scout bees leave the clustered swarm and search for a suitable cavity to serve as the colony’s new hive. The entire swarming event is controlled by the combined pheromones of the queen and worker bees. These pheromones are used to gather the swarm together at a resting point, and they also help the swarm of bees fly together to their new hive. Once the swarm arrives at their new hive, workers raise their abdomens and fan their wings to emit a plume of Nasanov gland pheromone to direct bees to their new home. In today’s photo, Jeremy Bemis and I capture a swarm. With the queen inside, workers are fanning Nasanov gland pheromone to call bees into the hive. Following a week of rain, the sun broke out to provide perfect spring weather in Little Rock for Bee Day. Held at Bemis Honey Bee Farm and Supplies, https://www.facebook.com/bemishoneybeefarm, the day-long event brought beekeepers from around Arkansas and adjacent states. More than two hundred beekeepers gathered to pick up the bees that they had ordered and to attend an assortment of events, both indoors and out. Inside, Rita demonstrated how to make products from the bee hive using honey and beeswax. I gave presentations on queen bee management and top bar hive management. 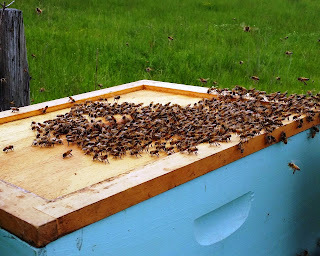 I was surprised at the number of people keeping bees in top bar hives. After I let each person handle top bar combs, they asked questions about methods of managing combs, feeding bees, harvesting honey, and managing hive pests. 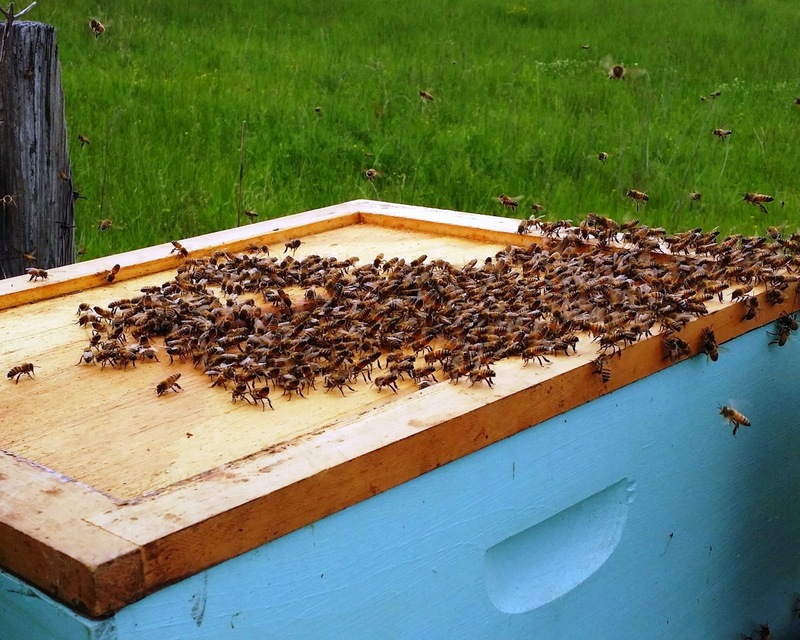 Top bar hives are favored in some cases by beekeepers in urban settings and by some who prefer to not lift heavy hive bodies and honey supers. 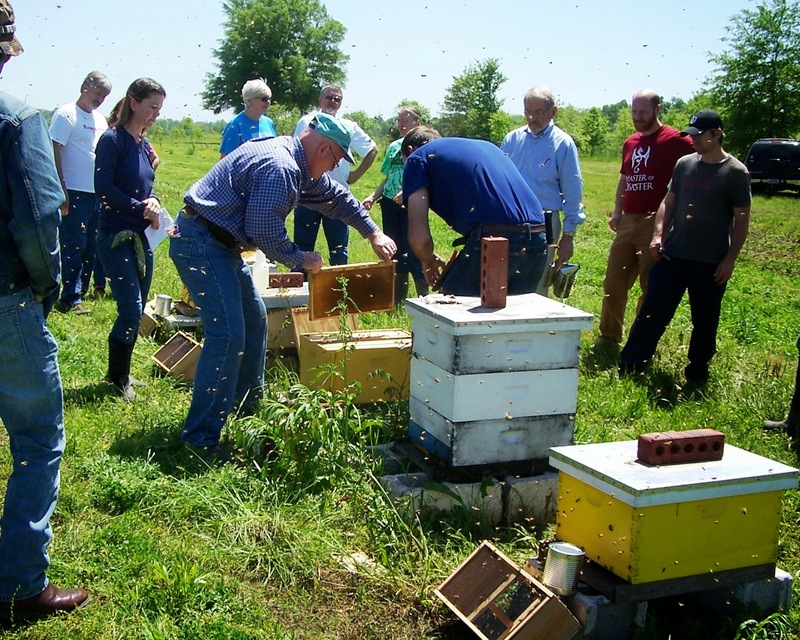 Outdoors, members of the Central Arkansas Beekeepers Association conducted demonstration sessions on how to light a beekeeper’s smoker and how to conduct hive inspections. Throughout the day, smoke drifted from the smoker completion. Bemis family members ferried people around the farm in hay ride fashion on a tractor-pulled wagon. Beekeepers shopped the bee supply store for hive equipment and bee suits. As the bee farm is located on Bemis Tree Farm, some purchased vitex trees and other bee plants. A food truck provided meals throughout the day, and the Central Arkansas Beekeepers brought a frozen honey dessert machine. With beekeepers picking up two hundred packages of bees and individual mated queens, demonstrations on installing packages of bees were well attended. In today’s photo, Jeremy Bemis helps a new beekeeper prepare a hive for a new package of bees. The group even got the opportunity to capture and hive a swarm of feral bees. Some questioned whether the swarm was conveniently planted. No. The swarm was a natural gift for Bee Day!